Why do you reckon artists release tons and tons of singles, maybe an EP- and then follow it up with a full-length album, comprising of 60 or 70 percent songs that we’ve already known and heard before considering that we’re fans of said artist? 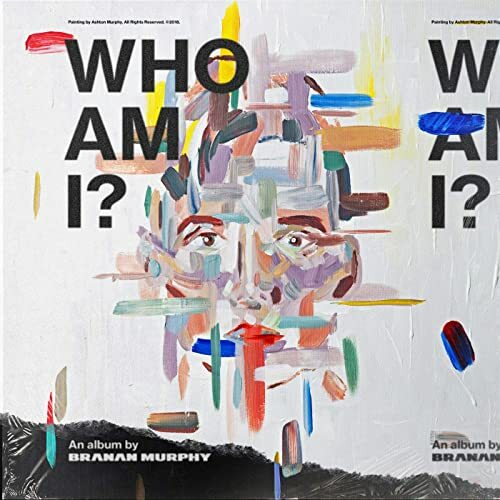 Like Sarah Reeves before him, and like Peabod, Apollo LTD and Unspoken that are releasing projects after him; CCM/pop artist Branan Murphy has done exactly that! Who Am I released about a couple of weeks ago- and if you have followed this site long enough that you would know that quite a lot of the songs that are present on this album, I’ve already reviewed! Either from the review of Branan’s self-titled debut EP, or reviews of his singles which released this year. But regardless of the somewhat ‘redundant’ debut full length that one could argue serves no purpose (except to seemingly introduce us to his more poppy version of Jasmine Murray’s song “Just A Vapor”, which could have been released as a single! ); the fact remains that sometimes it’s handy to have these songs all in one place- and if you’re the ripping type, you can place these songs from iTunes to a physical copy of a CD in case your soft copies are corrupted. So in that respect Who Am I? is ingenious. But for all of us who have heard these songs before- hopefully there’s not a long turnaround between this hopeful yet lacking project and something completely new from Branan. So now that we know that Who Am I? is essentially a ‘greatest hits’ album that doesn’t really introduce us to something new (but still at the same time delivers powerful anthems that are nonetheless impacting and inspiring! ); let me just end my ‘mini-review’/rant of Branan Murphy’s album by highlighting a few of my favourite tracks, and then the youtube playlist and spotify playlist…and then I’ll give it over to you. Will you continue in listening to Branan’s music, and eagerly anticipate his next all-new release? I sure hope you join with me in supporting Branan- and that’s because he’s a musical genius. CCM/pop/rap/EDM fusion? Yes please! Enough: Opening the EP with the confronting yet equally comforting “Enough”, we are met with question after question in this EDM melody, a melody that could be sung about God or about another thing we desire the most- our family or friends or spouse. As Branan poses the question of when did God (or whatever else) stopped being enough for us, and when did we start enjoying the presence of material possessions and other transient things more; we are encouraged to take a look inside the mirror and see if we are the person we want to be. If we’re not and we need to go back to who we once were, we need to figure out how to get there. And that’s no easy task, but “Enough” and the questions it poses is I reckon the first step for all of us on the journey of self-discovery and figuring out if how we are as people right now is where we want to be. All The Wrong Things, and Maybe: If you thought Branan’s deep pop was limited to only the first two tracks, you’d be wrong. It’s throughout the whole album. “All The Wrong Things” is a pop/rap/EDM melody with Koryn Hawthorne on guest vocals and is quite confronting, with Branan admitting that sometimes he does the things he doesn’t want to do, and doesn’t do the things he does want to. Because of sin in this world it’s easy for temptations to trip us up, and that’s exactly what “All The Wrong Things” is about- Branan relaying to us- without any clear answers- that he’s struggling. Only in the rap it is shown Branan surrendering his entire being over to God, yet the question is still posed to all of us. How would we live our life moving forward, if we know that we are doing the wrong things? Food for thought to ponder over; while the subdued, laidback electronic and keys led ballad “Maybe” is the most natural step in the progression of Branan’s journey of self-discovery, as he admits that while Jesus is relentlessly chasing and pursuing him, he is conflicted, and asks about himself ‘…maybe I’m not far, I just don’t wanna hear the truth, and maybe all my scars are just a map that leads to You. maybe I… maybe I’m crazy, or maybe I’m afraid of all the things I might become, and maybe I will finally have a place that I can run, maybe I, yeah… maybe it’s time… to give in…’. My Life: For a more pop and CCM sound and a ‘happy-go-lucky’ atmosphere, after all the introspective melodies detailing Branan’s discovery of running away from God and realising that He is the One worth following and pursing, we are met with the testimony like track “My Life”, a personal story about Branan’s dedication to Christ, and assertion that ‘…I’m not who I was before, look in my eyes, I’m not hiding anymore, yeah, we all fall short of perfect and I’m the living proof, so if you think God’s love could never find you, take a look at my life…’. It’s the culmination of all the questioning and all of the wrestling, and the peace that comes with realising that the God of all the universe wants to intimately know us, and laid down His life so that each of us can fully get to know Him and know of His love for each of us. It’s a mind-boggling concept, and Branan manages to relay to us that the change that has occurred in him may not be believed my non-believers yet, but if everyone looks at his life, there’s no denying that a change has happened. Branan attributes that change to Jesus and it’s up to each one of us that believe that claim or not. Perfectly: This past couple of weeks, Branan has further probed and prodded with his latest single “Perfectly”, and as we dive in and examine the notion of Jesus loving us all perfectly despite everything we’ve done- we can understand that Branan is a passionate man of God, who just wants to see the kingdom of Heaven be present on Earth in our lifetimes as well. “Perfectly” is a song describing exactly that- that Jesus loves us unconditionally and perfectly all the time. No ifs, no buts, no conditions. He loves us and that is that- and this notion should free us and make us more grateful and thankful for the cross and the resurrection. We were dead and unworthy, but without rhyme or reason, Jesus stepped in and paid the price. Not catch. Just unending love and us now sons and daughters of the Lord Most High. “Perfectly” is bound to boggle the mind, and no doubt some of us may not grasp the enormity of what Branan is conveying for a long while- but if we just sit with this acoustic melody and reflect upon the words of truth; then I’m sure our perspective and whole life will change.